Ever since Mendelian genetics was incorporated into Darwinism, evolutionists have believed that the gene is king. Genes, they thought, determine an organism’s design or, in technical jargon, the genotype specifies the phenotype. This fit their view that the species originated from the natural selection of biological change which did not arise initially as a consequence of need but rather as a consequence of random, spontaneous events. Those random, spontaneous, events were, for example, mutations in the genes. And later when the genetic code, which translates the information in those genes into proteins, was found to be essentially universal throughout biology, the story seemed complete. For if the species were designed why would their genetic codes be identical? But today, so many problems with this story have emerged it is difficult to keep track. And new research continues to add yet more problems. Aside from the non scientific claims underlying evolution’s metaphysics (what scientific experiment informed evolutionists that independently created species would necessarily have different genetic codes? ), the empirical science has contradicted evolution’s story at every turn. Genes are not king, mutations show no sign of creating biology’s marvels in spite of evolutionist’s many attempts to coax them to show off their power, the genetic code has special properties and shows no sign of having been a “frozen accident,” and all kinds of new codes have been discovered that are not universal but instead are lineage-specific. One interesting part of this on-going contradiction of evolutionary theory is the role of proteins referred to as transcription factors which help to regulate the expression of genes. The elaborate genetic regulation processes are fascinating and you can read more here, here, here, here, here, here, here, here, here, here, here, here, here, here, here, here and here. It highlights yet another chicken-or-the-egg conundrum, for proteins are produced from the information in genes, and yet proteins are required in that very production process. One of the types of proteins involved are the transcription factors which help to turn genes on or off. They bind to nearby DNA regions that flank the genes to influence the genetic copying machine. The DNA sequences in those flanking regions as well as the transcription factors are important in determining the genetic regulation. But the action of these transcription factors is not universal or consistent across species but rather are lineage-specific. Evolutionists were surprised when transcription factor binding was found to be not conserved between mice and men, between various other vertebrates, and even between different species of yeast. If a universal code confirms evolution then a non universal code contradicts evolution. In other words, evolution created special DNA regions so that evolution could then occur. 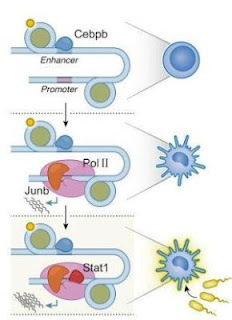 Another such complication is that transcription factors can not only start and stop the RNA polymerase copy machine, they can also pause the machine after it has begun. And other transcription factors turn off the pause, so the transcription process may continue. So astonishingly, evolution must have created these profound complexities from random mutations so they could then be selected. Now new research adds to this story with a massive study of the interactions between transcription factors and DNA. The study found that the action of transcription factors falls into three distinct, hierarchical, categories. There are interactions that specify the basic cell type (muscle, skin, nerve, and so forth). Then there are interactions that specify the cell’s sub-identity (the particular type of muscle cell, for example). And finally there are interactions that specify the cell’s response to the current environmental challenges. Of course evolutionists have no explanation, beyond vague speculation, of how such a hierarchy of mechanisms could have arisen spontaneously. But for now no such explanation is needed. Evolution is known to be a fact and so we can be confident that future research will explain all these apparent contradictions. That’s how evolutionary theory works.